“There is a thread in my literary training that was focused on rhetoric and the composition of arguments. I studied formal logic and that segues very nicely into computation,” said Jockers. 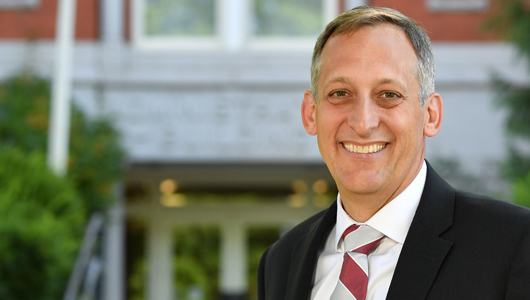 Today he is a leading voice in literary text mining and digital humanities, and, as of August 1, the new dean of the WSU College of Arts and Sciences. Higher education needs both deep-focused thinkers and broad-minded collaborators, said Jockers. Jockers’s own spirit of inquiry stems from growing up splitting his time between a very small town in rural Montana and a very wealthy suburb of New York City. The dichotomy of these two environments provided him with a unique perspective on the world and exposed him to a broad spectrum of people with markedly diverse opinions and experiences. Looking for and making connections became second nature. Throughout his successful 20-year career as an educator, administrator, scholar, entrepreneur, and tech industry insider, Jockers has continually sought to find ways to connect people and places. His research and business collaborations span disciplines from bioinformatics and history to engineering, political science, physics, and more. “I may be an English professor, but I’m also part of the sciences and the social sciences and we work together to create positive and interesting experiences for our students,” he said. As a high school student in the 1980s, Jockers discovered mainframe computing. Drawn to its distinct and focused approach to problem-solving, he found coding and programing a pleasant diversion from his academic work. “The two things had nothing in common in my mind at that time,” he said. Then in the mid-1990s, as the World Wide Web began to flourish, Jockers’s technical acumen led to a project helping his Ph.D. advisor digitize the Irish literary texts housed in the Southern Illinois University library. With a trove of interesting text now easily and electronically accessible, the proverbial light bulb lit up. “I was working on a study of Beowolf at the same time and had become very interested in counting the way the poet used meter and rhythm in that poem. I was counting it by hand and had stacks of sheets of yellow paper,” Jockers recalled. He successfully translated his counting-oriented analysis into a computer program and thus began his interest in using computers to explore literature. Following his extensive work in Irish literature, digital methods, and literary history, Jockers turned his attention to extracting and visualizing key elements of top-selling novels. In 2016 he co-authored The Bestseller Code: Anatomy of the Blockbuster Novel. Currently, he and his graduate students are exploring U.S. Supreme Court decisions and the extent to which liberal/conservative bias manifests itself in the writings of different Justices.